Last Wednesday’s Full Council may well be the last I attend for quite sometime as I am moving out of the area so I thought I’d make an effort to witness the political shenanigans one last time. I won’t give a verbatim report, as now you can watch and listen to the entire meeting of the councillors who bothered to turn up (the Mayor’s apology list was nearly as long as the attendance list!) courtesy of the Ipswich Spy parish (scroll down for video). Even with the apologies from all parties, Labour still rule the roost in Ipswich with three long rows occupied by the socialists with the Liberal Democrats (all two of them!) and the Conservative Group shuffled off to the far side of the room. It will only get worse come the May local elections when, as I have predicted before, there will be another bloodbath of the blues. Thankfully, it will be the high water mark for Labour but the Tories will be out of power for up to 20 years (and that’s no exaggeration). Council Questions covered a broad range of subjects and were kicked off by local Tory blogger, Kevin Algar, who asked questions on tourism and facilitating social media reporting. It was somewhat amusing to hear Mr Algar ask what the council were doing to facilitate filming of public meetings, whilst Ipswich Spy‘s Ben Redsell was filming to his right hand side. A case of being a bit late to the party! Mr Algar also encouraged the ruling Labour group to have Ipswich Borough Council meetings in Suffolk County Council’s head office because it is set up for webcasting. Rightly, Labour leader Cllr Ellesmere slapped him down and pointed out Ipswich Borough should have their meetings in their Council chamber in the magnificent Town Hall not a corporate office block. The questions on tourism from Kevin Algar were typically not answered by Labour’s Economic Development chief Cllr Carole Jones. She has a perfect ability to just waffle a reply to any question which – if you can hear her rather grating and whining voice at all – are couched in local government speak to the point of incomprehension. For some reason only known to Cllr Kym Stroet, he asked a question to Labour’s culture spokesman Cllr Bryony Rudkin which managed to reignite the Broomhill Pool row. “Does the portfolio holder believe that spending £1 million on a lido, likely to be used by very few people, is a wise use of taxpayers money?”, Cllr Stroet posed. This caused an uproar of heckling from the public gallery. Now, I’m not in a favour of any public money being given to starting up an outside pool business, which very few people want to pay to use, but there are a lot of people in North West Ipswich who are exercised by the Broomhill Pool nostalgia – and most of them vote in seats the Tories are trying to win or hold on to! Baffling. Labour’s housing chief from the 1970s and also in the year 2014, Cllr John Mowles, was asked a question by former Tory group leader Cllr John Carnall about the decision by the Council to knock two homes together to house an unemployed couple and their (now) thirteen children and why he didn’t listen to the 84 petitioners who were against the move at a cost which is now almost three times the original budget. “I have no intention of discussing this and I am surprised this was raised and it disappointments me and demoralises councillors when such a question is asked – it should not be aired in public!”, Cllr Mowles replied. What on earth is he talking about? The council is spending a large chunk of taxpayer’s money commensurate with the Borough Council’s relatively small budget and Cllr Mowles has the audacity to say it is an issue which should not be raised in public. This smacks of Labour not wanting to discuss a subject they are ideologically influenced by and was boosted by Cllr Sandy Martin saying during the Council Rent Increase report later in the meeting he would prefer to see everybody in Ipswich live in a council house! Well, if he is that keen on living in a council-owned property, why doesn’t he move down the road from his privately rented cottage on Milton Street to the Priory Heath estate? As was decided at last week’s Executive meeting (the real power-base of the Council), Full Council on Wednesday was asked to rubber-stamp a 5.5% increase in council house rent. Several Tory councillors asked how this policy ties in with Labour nationally always bleating on about the “cost of living crisis” – no answer did cometh from Cllr Mowles or Labour leader Cllr Ellesmere except to say they were “only following Government guidelines”. Conservative Cllr Carnall retorted the only reason rents were going up was to fund the new Council home building programme done to bolster Cllr Ellesmere’s Labour parliamentary campaign. There’s more than a grain of truth in that statement! Later in the same meeting, there was a report discussing business rates and the Government’s plan to let Councils keep most of the money raised (before the Coalition came to power, all of the business rates were sent to Whitehall for re-distribution into Labour heartlands). Supposedly, there has been a few issues with the paperwork and Grafton House mandarins haven’t been able file their documentation to Whitehall yet. The Labour group naturally blamed central Government and Cllr Ellesmere used the opportunity to let the Council know he was still waiting for Secretary of State for Local Government, Eric Pickles, to tell him the council tax increase percentage threshold at which the Borough must ask permission of residents in a referendum – no doubt so he can lower it by 0.0.1% and then that will be this year’s council tax increase in Ipswich! Just for the record, Government guidelines stipulate council tax should be frozen but it seems the Labour-run council are ignoring the guidelines when it suits them. There was an interesting report from Labour’s rising-star and Borough communities chief, Cllr Adam Leeder, where he told the meeting Area Committees were receiving new powers, mainly to do with being able to spend their budget as they see fit rather than always deferring back to the Executive. The points of interest weren’t in the detail of the report but in the debate amongst councillors. Cllr Sandy Martin made the most pertinent point when he told the meeting just one Area Committee represents a greater population size than any parish or town council in the rest of Suffolk, but still Conservative-run Suffolk County Council were not engaging with Ipswich’s Area Committees despite actively engaging with a Parish council in Lavenham or Bury St Edmunds Town Council. You just need to look at Suffolk County Council’s ‘Find your County Councillor’ site, where Ipswich is relegated to a ‘Parish’ to see the point! This is one of the most powerful arguments for Ipswich being a Unitary Authority. Ipswich Borough Council has very little power, apart from planning application matters. All the roads, verges and any changes to traffic flow in the town are in the hands of Suffolk County Council; earlier in the meeting, Liberal Democrat Cllr Inga Lockington raised the condition of grass verges in the estates of Ipswich since the County Council took away the Highway Authority from Ipswich (meaning no decisions on anything to do with transport are now taken by the Borough Council) and low and behold it is nigh on impossible to get a verge repaired in Ipswich because it is like trying to climb Mount Everest to get it in the hands of a bureaucrat at Endeavour House, who has the whole of Suffolk to look after. Additionally, all the local authority schools are run from Endeavour House and as Cllr Martin made patently clear, the corporate structure at the County Council doesn’t even recognise the main conduit of communication between the electorate and their councillors. It is as if Ipswich is East Germany behind a modern day Berlin Wall, out of sight of County leader Mark Bee and his Cabinet in the “West”. Despite Labour’s Cllr Martin articulating the raw deal Ipswich receives from Suffolk County Council, it was pointed out by Cllr Carnall that Ipswich has 11 Labour county councillors compared to just the one Tory in the Borough and perhaps they should get on with lobbying the County Council on behalf of Ipswich and its residents. Another notable aspect of the Council meeting on Wednesday were the number of people in attendance to ask and support questions on the proposed Northern Fringe development. Questions on sewerage, traffic congestion and the New Homes Bonus were asked – all with an anti-development slant. Both Labour and the Conservatives (who cares what the Liberals think!) are in favour of building houses on the northern outskirts of Ipswich’s borough boundary; it was the Tories who approved it in the Local Development Framework when they were in power before 2011 and Labour are naturally in favour of upping the number of social houses built. So it really has become now a Town versus Country issue. As soon as the Council Questions were over, there was a mass exodus of rich baby boomers and their flat caps as they traipsed back to the 4X4s and their pretty villages. God forbid Ipswich will have more houses for their children to live in! And this was the main thrust of the meeting, all two hours of it filmed below for your infotainment. Next time, Ipswich Spy won’t have to beg the Grafton House mandarins for permission, as the right for public meetings to be filmed by bloggers and the mainstream media is now enshrined in law, courtesy of Eric Pickles’ Local Audit and Accountability Bill which obtained Royal Assent the next day. Categories: Politics | Tags: A Riverside View, Ben Redsell, blogging, Broomhill Pool, Cllr Carole Jones, Cllr David Ellesmere, Cllr John Carnall, Cllr John Mowles, Cllr Sandy Martin, Conservatives, council rents increase, council tax, Eric Pickles MP, filming, Ipswich Borough Council, Ipswich Spy, Kevin Algar, Labour, Liberal Democrats, Local Audit and Accountability Bill, Northern Fringe, social media, Suffolk County Council | Permalink. These are the people who run Ipswich and it is the first time (I’m aware of) they have been filmed, outside of the stage-managed arena of the Full Council meeting at the Town Hall, in the power base that is the Executive Committee. It is the Executive (also known as Cabinet at some local authorities) where the crucial decisions affecting Ipswich residents and businesses are made. Even the Council Tax is set at Executive and only rubber-stamped at Full Council when the ruling party has a majority – which the Labour Party certainly do, having 21 more councillors than their nearest Tory rivals. I congratulate Ben Redsell over at the Ipswich Spy parish for spending a large amount of time getting to the point where he could film the Executive Committee last night. Grafton House mandarins have been reluctant to comply with the Local Government Secretary of State’s advice (soon to become Law) to Councils to allow filming, tweeting and reporting at all local authority public meeting, but with persistence Mr Redsell was able to overcome these obstacles with some caveats. Officers were not filmed – a whole bank of them – probably more than the number of councillors present are sitting to the right of the Executive Chairman and Council leader, Cllr David Ellesmere. In local government, councillors are paid an allowance not a wage and certainly not enough money to make it a full time job (if they want to eat and pay rent/a mortgage that is) so the Officers wield much more commensurate power (with many decisions delegated to them to save on councillor time) than civil servants have in Whitehall – making a case for senior officers to be filmed as they direct proceedings. Ipswich Spy – whilst filming is in its infancy – have, rightly, taken the decision not to antagonise the powers-that-be by filming the Chief Executive and his Directors. Ipswich Spy is also taking full responsibility for data protection, which would not be the case if they were just filming say the external architecture of the beautiful Town Hall on the Cornhill – another public place just like the Orwell Room at Grafton House was during the Executive Committee’s meeting. That’s a discussion for another time but you can gauge how difficult it was for Ipswich Spy to film last night and they should be congratulated for their public service. The decisions made at this Executive meeting were to increase council housing rents and approve funds (details excluded from the public) for the Holywells Park renovations, amongst other items. The full Agenda can be read here. Categories: Politics | Tags: Cllr David Ellesmere, council housing rent, Executive Committee, Holywells Park, Ipswich Borough Council, Ipswich Spy, Local Audit and Accountability Bill | Permalink. 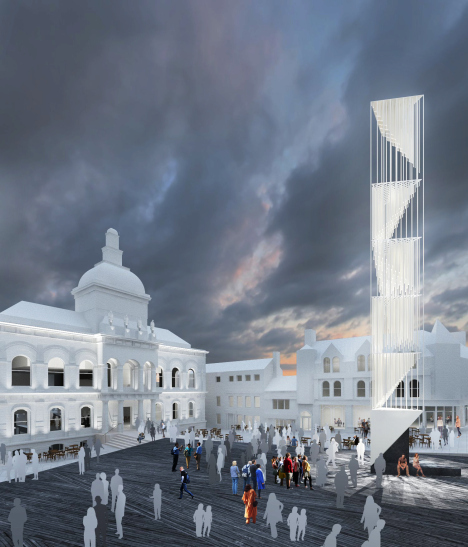 Today, Ipswich Borough Council along with Ipswich Central have announced the ‘winner’ of the new design for the Cornhill – Ipswich’s equivalent of the town square. Unfortunately, the choice was not actually in the competition announced to the public in September last year, which begs the question why did the Borough Council bother to ask Ipswich residents which scheme they preferred? Isn’t a local authority meant to practice the virtues of democracy or at least be seen to? Anyway, a variant of Concept C (unfortunately no longer online) was chosen by the powers-that-be in Ipswich. The judging panel was made up of Labour council leader David Ellesmere, Conservative Ipswich MP Ben Gummer, the town centre management company Ipswich Central, Suffolk County Council leader Mark Bee, a representative from University College Suffolk and Jay Merrick, the architecture writer on The Independent newspaper. Concept C was the one with the 2001: A Space Odyssey style tower in the centre of the Cornhill albeit without gorillas clawing at its base. However, we are told by the judging panel the tower will be ‘remodelled’ by ‘winning’ architects Hall Mcknight. “You’ll see through it, so it doesn’t stand in the way of seeing the buildings behind it,” partner Mr Hall said. The architects also propose to level the Cornhill from the bottom of Lloyds Avenue to the front of the Town Hall. There will still be unlevelled space going down past Mannings and the Golden Lion public houses so a ‘cafe-style’ environment with tables can be set-up outside these premises. With no disrespect to the proprietors of these premises, they are hardly glass of chianti and cheese establishments – more Carling and vodka shots. Although I am very much in favour of improving this public space as a magnet to attract more people to spend money in the town centre and help Ipswich grow, there is an elephant on the Cornhill which just won’t go away. What am I talking about? The market. 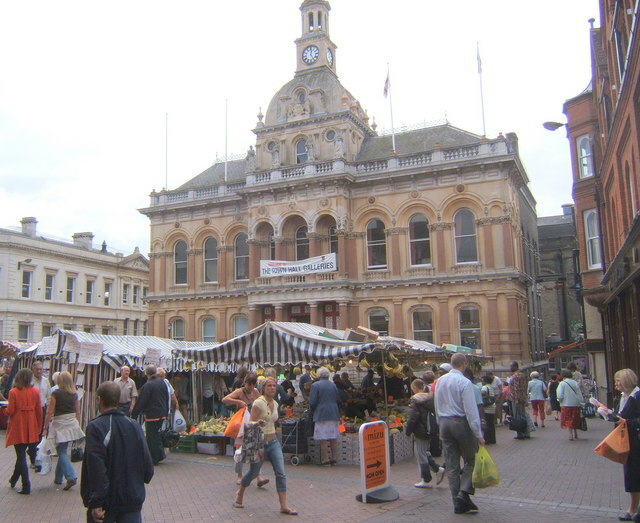 Former M&S boss Sir Stuart Rose – who gave Ipswich Borough Council the idea to re-design the Cornhill back in September 2012 – called for the market to be moved. Labour’s Cllr David Ellesmere at the time lept out of his seat at the Ipswich Beacon Conference Sir Stuart was speaking at to say he thought moving the market was a great idea. At the time, I questioned his sincerity and sadly my suspicions have been proven right. You see the traders are Labour’s chums and even though the market is a tatty, somewhat aggressive, dirty affair on four days a week, the Labour-run council aren’t going to bite the hand that feeds them and push the market down Princes Street where it belongs. Conveniently for Labour, Sir Stuart Rose was not at or wasn’t invited to today’s press conference to announce the ‘winning’ design. There’s no doubt Sir Stuart gave the Borough Council a good kick up the backside when he rattled off several ways to improve Ipswich’s offering (only one of which was the Cornhill improvement) but he put a figure of £200,000 on the re-design. Once the Grafton House mandarins got their fingers on it, the cost has rocketed to £3.5 Million, which is another half a million on top of the £3 Million announced at the start of the public ‘consultation’ in September last year. At this rate, the budget could be heading north of £4 million by the time it is finished. No wonder Sir Stuart stayed away: he’s got a business reputation to protect. The decision by the judges to opt for the revised Concept C was unanimous. It is understood the amended design was chosen as it would allow the Cornhill space to remain flexible. The total funds for the project have still to be found: a fundraising campaign will now begin with town centre businesses being asked to contribute. Ipswich Borough Council has already allocated £800,000 of taxpayer’s money to the project. The next question is one of timescales. When can we expect to see the implementation complete subject to the cash being stumped up? Categories: Politics | Tags: Ben Gummer MP, Cllr David Ellesmere, Cornhill, Hall McKnight, Ipswich, Ipswich Borough Council, Ipswich Central, Jay Merrick, Sir Stuart Rose, Suffolk County Council, University College Suffolk | Permalink. As reported in today’s national press, UKIP continued their march to the European elections later this year by winning a landslide victory in two by-elections in Haverhill, west Suffolk on Thursday. Nigel Farage’s party managed to get more votes than all the other parties combined. The election was held to fill vacant seats on St Edmundsbury Borough Council and Haverhill Town Council after former town mayor Les Ager died last year. 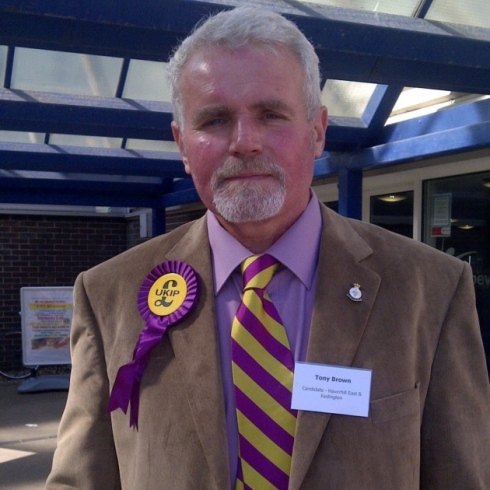 Tony Brown – who is also a Suffolk County Councillor for Haverhill – won Haverhill East ward on the Borough Council for UKIP with a majority of 54 per cent, more than double that of his Labour opponent Pat Hanlon with 24.5 per cent. And the Haverhill East town council seat was won by UKIP candidate Paul Firman with 64 per cent of the vote, triple that of the Labour candidate Liz Smith. This victory follows on the back of the Suffolk County Council elections last year when UKIP gained eight seats – they now hold nine seats at Endeavour House – and pushed the Tories into third place in four out of the thirteen divisions in Ipswich. Is this a sign of things to come when voters go to the polls in the European and local government elections on 22nd May? In Ipswich, UKIP currently have no council seats at Grafton House and this may well still be the case after the count but based on the County Council results last year they are likely to cause more upset for the Conservative Party in seats like Stoke Park and Holywells, where – if they stand – they could end up splitting the Tory vote and allowing Labour to win. But even without UKIP contention, seats like Holywells are looking very precarious. Back in 2012, popular former Borough Council leader Liz Harsant just about scraped home with a majority of 49 over her Labour challenger. Do we really think Cllr George Debman will hold on to Holywells this time round? If UKIP stand in Holywells he will lose by several hundred votes. In the European poll, I’d put money on UKIP winning the elections. Categories: Politics | Tags: Cllr George Debman, Cllr Liz Harsant, European Elections, Haverhill, Haverhill East, Haverhill Town Council, Ipswich Borough Council, local government elections, Nigel Farage, Paul Firman, St Edmundsbury Borough Council, Suffolk, Suffolk County Council, Tony Brown, UKIP | Permalink. Despite the Government of the day and the Labour Party in Westminster consistently telling local government to stop blocking bloggers and citizen journalists from reporting on public meetings, local councils are continuing to act like Soviets in the former USSR. And last night Ipswich Borough Council refused permission for local blogger Ipswich Spy to film the Executive Committee’s public meeting where the ruling Labour Party make key decisions affecting the town’s residents and businesses. Ipswich now joins the ranks of councils in Carmarthenshire, Yorkshire and Lincolnshire in continuing to ignore the Secretary of State for Local Government, Eric Pickles, call for local authorities to allow the recording and reporting on all public meetings. The Conservative-led Government has had enough of councils acting like tinpot dictators when it comes to promoting transparent democracy and have decided to legislate to force local authorities like Ipswich Borough Council to open their public meetings to reporting by all electronic communication means: blogs, Twitter, sound recording and filming. The Local Audit and Accountability Bill, which has now completed all its stages in the House of Commons and House of Lords, will include a law to enshrine a blogger’s – or any member of the public for that matter – right to tweet, sound record and film the proceedings in town halls in England. The Bill will receive Royal Assent early next year. As Ipswich Spy pointed out in their post yesterday, the Executive Committee of Ipswich Borough Council is the power committee: all key decisions are made here. Please do not be fooled that the council meetings at the Town Hall have any real significance – they are mainly a show council meeting to go through the motions of democracy. The Labour leadership ensure anything of real importance, such as spending hundreds of thousands of pounds of taxpayer money on a new ICT platform and council housing contracts, are taken at the Executive Committee within a secure office meeting room – as was the case last night. Grafton House mandarins spent an inordinate amount of time trying to find a way to stop Ipswich Spy from filming key decision making at the Executive Committee. Soon they will have to grant permission swiftly. Categories: Politics | Tags: blogging, Brandon Lewis MP, Eric Pickles MP, Ipswich, Ipswich Borough Council, Ipswich Spy, Labour, Local Audit and Accountability Bill, local government, open democracy, Socialists, Westminster | Permalink. You really have to question the competence of the public sector on a day like today. I took my wife to the railway station at 07.00 this morning and found one of the main East-West arterial routes through the town closed. 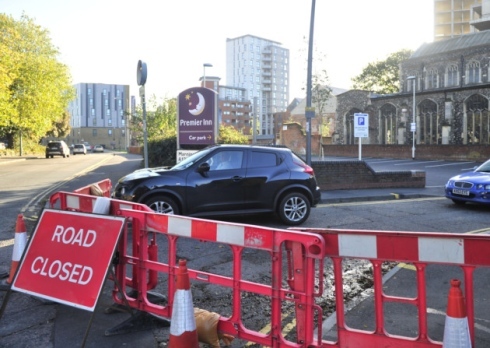 The same stretch of road, Key Street/College Street on the Waterfront gyratory, was closed yesterday due to the wind blowing some fencing down and a lamp post during Monday morning. Almost 24 hours later, the same stretch of road was still closed. Traffic is being taken down half the Waterfront-side gyratory heading west and then is swiftly diverted north up on to Star lane and through Waterworks Street and Bond Street, taking all East-West bound traffic through the north side of the town centre along Crown Street. As would be expected, this has caused gridlock for traffic coming from the East of Ipswich. Ok, I understand if a lamp post comes down, it needs to be removed. But how long does it take to do this? I have also received reports the police believe – they don’t know – there is structural damage to one of the buildings adjacent to the road. At the time of writing Ipswich Borough Council’s Building Control team are yet to assess if the building is safe and Ipswich can be re-opened for business. This question needs a serious answer from Borough Council chief Russell Williams: why weren’t your Building Control team on-site 24 hours ago? Why haven’t they made their assessment yet? Can they not work overnight on some measurements? It is not acceptable for a bit of wind to bring Suffolk’s county town to a halt. It is regrettable four people died in the storm yesterday across a population of 66 million but we cannot use the weather as an excuse for the public sector to ramp down their work even further than they do when we have calm conditions. Britain’s climate is warm, wet and WINDY! We should be better prepared to respond to our own climate, experienced in these islands for millennia. In London over the summer, a skyscraper was melting cars and anything else that stood under it’s gaze because the ‘Walkie Talkie’ building in central London was magnifying sunlight on to the road and pavement below. What did the City of London authorities do? Did they close the road? Err, no! They ordered the building owner to put up some material on the windows causing the reflection pronto, which was duly done with no disruption to Londoners, no road closures, nothing. We just pitied the poor man who came back to find his BMW melted. Why in the provinces do we have to put up with a ‘third-world’ standard of public service? Perhaps, because the majority of people don’t moan like ambitious, confident Londoners would. Either way, it’s not acceptable for Health and Safety to be used as an excuse for the public sector to be even more inefficient than they usually are, which takes some doing! Oh you pay us £6,000 a year for a train service? Sorry, get the bus! Things then got worse once I was finally able to drop my wife off at the railway station. Greater Anglia and Network Rail – the paragons of railway incompetents – found 24 hours was also not enough time to lift a few branches off the line and fix some signalling and so Suffolk’s county town still does not have a railway service to London, with all trains suspended to Liverpool Street. 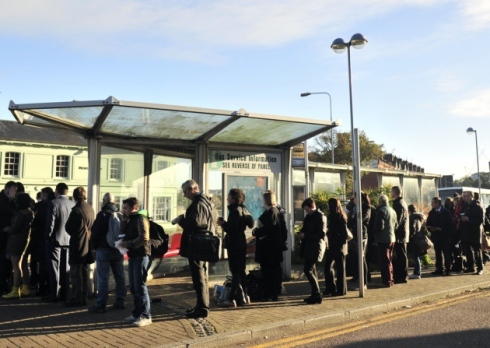 Instead, my wife, who pays Greater Anglia £6,000 a year to travel in worse conditions than cattle, had to queue for a bus to Manningtree then a ‘bus on rails’ to Colchester before finally being able to take an inter-city service to the capital. It took her three hours to get to work! This is frankly completely unacceptable and again would seem to be incompetence and inefficiency on behalf of the publicly owned Network Rail, heavily in hoc to the Unions who can’t wait to find an excuse to down tools (look at Grangemouth!) and Greater Anglia who, like the big six energy firms, can do what they like because where else has the hard-pressed commuter got to go? What is wrong then? Is it all down to ill-judged health and safety concerns? Is it because we have lost our stoicism as a nation which saw us win two world wars? Is it because we have such an imbalanced economy that our infrastructure can’t cope with London being the only place to actually make a decent wage, bar a few exceptions? Or is it just public sector incompetence? I’d love to hear your views in the comments. Categories: Ipswich Borough Council, Politics | Tags: Greater Anglia, gridlock, incompetence, Ipswich, Ipswich Borough Council, Network Rail, public sector, Russell Williams, wind | Permalink. As regular readers will know I have been campaigning through my blog, along with Ben Redsell of the Ipswich Spy parish, to persuade the Executive committee at Ipswich Borough Council to enhance democracy in local government and start webcasting their six-weekly meeting of all 48 councillors and key committees such as Planning and Overview & Scrutiny. In February this year, I took my campaign in person to the Town Hall and exercised my democratic right as a resident of Ipswich to ask a Council Question to the councillor responsible for IT, Cllr Martin Cook (and fellow employee of technology giant, BT). I asked Cllr Cook if the Borough Council would follow the lead of other English councils and start webcasting their public meetings. Unfortunately, and in a obscure roundabout way, Cllr Cook refused. Despite the rebuttal I and fellow bloggers haven’t gone away. We are not campaigning to enhance our readership figures or ‘play with’ technologies. We are campaigning for local government decisions to be made open and transparent to benefit the democratic process in this town. 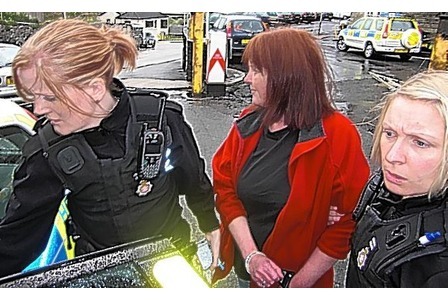 Up and down the land, including in Yorkshire and Lincolnshire, bloggers have been refused permission even to tweet council meeting proceedings and at Carmarthenshire County Council when local blogger Jacqui Thompson tried to film a public council meeting, the Council called the police and had Mrs Thompson arrested. Anyone would think we were in East Germany or the People’s Republic of China based on the behaviour of local government officials. But now local council mandarins are being brought to book. The Secretary of State for Local Government, Eric Pickles MP, is bringing forward a law to enshrine a blogger’s – or any member of the public for that matter – right to tweet, record and report the proceedings in town halls in England. Unfortunately, the law will not have jurisdiction in the devolved assemblies of Wales, Scotland and Northern Ireland so our fellow blogger in Carmarthenshire may have to lobby her Welsh assembly politicians a bit more on this one. The news laws will be part of the Local Audit and Accountability Bill, which is set to be debated by MPs in the House of Commons on Monday 28th October, having completed its Lords stages. You can follow it’s passage through parliament on the UK Parliament website. It is not acceptable for councillors to close their doors on the people who have elected them and effectively take decisions on their behalf with no reporting by the media. Only last month at the Town Hall meeting of councillors in Ipswich, no one from the mainstream media turned up to the meeting. The only reporters were bloggers who are unpaid volunteers providing a free public service because of their commitment and passion for local democracy. During the meeting, three Conservative councillors walked out of the meeting in protest at how the ruling Labour administration were answering the public’s questions. This is a very serious matter – as it goes to the heart of how the democratic process is conducted in Suffolk’s county town – but the local newspaper – the Ipswich Star – took almost a week to report this story. It was reported within minutes by the bloggers in attendance. The introduction of webcasting would have ensured the decisions taken or public points swiped away by the ruling Executive were known to the taxpayers and electors of Ipswich in real-time. In Westminster we rightly have televised proceeding of all House of Commons debates and Committees (no one is asking for that in local government) but webcasting is a proven technology and relatively cheap to implement and will go a long way to closing the gap between voter and councillor in local government. Many decisions taken at Ipswich Borough Council actually have a greater impact on the day-to-day lives of Ipswich residents and businesses than those taken in Westminster, which may not have an effect on the town and in many cases have a very long lead time before implementation. I would ask Ipswich Borough Council’s ruling Labour Party to look again at their decision to refuse webcasting of their Full Council meetings (in the first instance) before Parliament forces their analogue hand into our digital world. 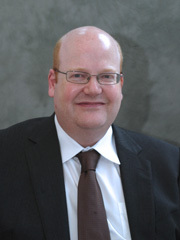 Categories: Ipswich, Ipswich Borough Council, Politics | Tags: Carmarthenshire County Council, Cllr Martin Cook, Eric Pickles, House of Commons, Ipswich, Ipswich Borough Council, Ipswich Spy, Jacqui Thompson, Local Audit and Accountability Bill, local government, UK Parliament, webcasting | Permalink.